Cotton is a fiber obtained from various species of woody plants and is the most important and widely used natural fiber in the world. The leading cotton-producing countries are China (the world's biggest producer), the United States, India, Pakistan, Brazil, and Egypt. The world production of cotton in the early 1990s was about 21 million tons (19 million metric tons) per year. The world's largest consumers of cotton are the United States and Europe. Cotton was one of the first cultivated plants, and it has been a part of human culture since prehistoric times. There is evidence that the cotton plant was cultivated in India as long as 5,000 years ago. Specimens of cotton cloth as old as 5,000 years have been found in Peru, and scientists have found 7,000-year-old specimens of the cotton plant in caves near Mexico City, Mexico. 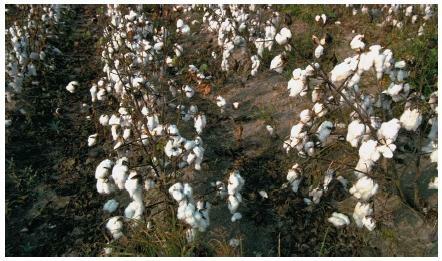 Cotton is primarily an agricultural crop, but it can also be found growing wild. There are more than 30 species of cotton plants, but only 4 are used to supply the world market for cotton. The cotton plant grows to a height of 3 to 6 feet (0.9 to 1.8 meters), depending on the species and the region where it is grown. The leaves are heart-shaped, lobed, and coarse veined, somewhat resembling a maple leaf. The plant has many branches with one main central stem. Overall, the plant is cone- or pyramid-shaped. in color. After the boll matures and bursts open, the fibers dry out and become tiny hollow tubes that twist up, making the fiber very strong. Cotton requires a long growing season (from 180 to 200 days), sunny and warm weather, plenty of water during the growth season, and dry weather for harvest. Cotton grows near the equator in tropical and semitropical climates. The cotton belt in the United States reaches from North Carolina down to northern Florida and west to California. Cotton plants are subject to numerous insect pests, including the destructive boll weevil. For centuries, harvesting was done by hand. Cotton had to be picked several times in the season because bolls of cotton do not all ripen at the same time. The cotton gin, created by American inventor Eli Whitney (1765–1825) in 1793, mechanized the process of separating seeds from fibers, revolutionizing the cotton industry. Before going to the gin, harvested cotton is dried and put through cleaning equipment that removes leaves, dirt, twigs, and other unwanted material. After cleaning, the long fibers are separated from the seeds with a cotton gin and then packed tightly into 500-pound (225-kilogram) bales. Cotton is classified according to its staple (length of fiber), grade (color), and character (smoothness). At a textile mill, cotton fibers are spun into yarn and then woven or knitted into cloth. At an oil mill, cottonseed oil is extracted from cotton seeds for use in cooking oil, shortening, soaps, and cosmetics. i would appreciate to receive more info from you regarding cotton as i intend to grow it. How much of cotton will a plot of 1km x 1km produce?